Paul Pogba is relishing Manchester United's huge clash with Chelsea as he prepares to go up against the player he rates as the Premier League's best in Eden Hazard. Rafael Benitez's men were 2-0 up at Old Trafford in that match before the hosts battled back to secure a late win and relieve some of the pressure that was building on Jose Mourinho. 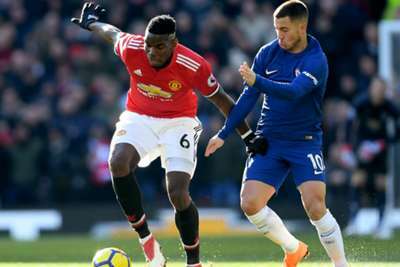 Pogba is excited about playing in such big games, though he has no doubts about the size of the task facing United against Maurizio Sarri's side, particularly with Hazard - the Premier League's leading scorer with seven goals - in such fine form. "For me, these games are the best games to play. You play against the best players, you play against a big club, a big story. You play football to play those big games with a lot of pressure. That's what you want to play," Pogba told Sky Sports. "You can see this season [Chelsea] have a lot of possession. Obviously, they are winning, they have one character you cannot miss in Eden Hazard. "They say he is on fire, at this time he is probably the best player in the Premier League right now. "The team is going well too, they have good results. For us, we come back from the Newcastle game, 3-2 winning at home, we need points, so it's going to be a tough one. I think they need points, we need points. "The game is going to be very hard, we're playing away. It's a Chelsea versus Man United match, so it's a big one."